Our Fearless Leader (referred to from this point forward as O.F.L.) lets me take the lead for the first ISI ethnography. I know from previous experiences that the first ethnography tends to set the stage for the ethnographies to follow. It typically takes a solid week for most of us to feel comfortable enough to create an ethnography in our own vision. This, of course, makes perfect sense. Purposefully ambiguous expectations, institutional pressures to conform, and the hegemony of the model text make mimicry an understandable solution. So I’m going to make this inaugural ethnography somewhat short and to the point. I encourage you all to write the ethnography however you want. Personally I’m not really pushing myself. First-person non-fiction narration is where I feel most comfortable. I survey the room. The future teacher consultants seem split 50/50 on the use of digital vs. analog writing implements. The presence of so many pens might also have something to do with the first day’s spotty Wi-Fi. Michelle, a notebook fiend, might also be unwittingly inspiring some of us to ditch the district-provided laptop in favor of colorful pens. We’re sitting and writing. This is an abridged version of our morning pages routine, a daily chunk of time devoted to nothing but sitting and writing. I wonder what everyone is writing. I would imagine equal parts diary/journal stream of consciousness narration, checklists and schedules, and clandestine email checking. I notice that many of us are also scribbling away on sticky notes for the ice breaker. OFL’s equally fearless daughter created a neat ice-breaker activity, so many of us are penning our six word memoirs, pet peeves, sin foods, and etc. to place on large pieces of chart paper. You can already draw a few conclusions about everyone’s personality based on how they chose to complete the sticky note icebreaker. Some place their sticky notes in nice and neat Jeffersonian grids while others prefer a scattershot approach. Some use drawings while others create elaborate mini-essays. Jokes are made. Mostly of the semi-corny variety best suited for first encounters. I do my usual routine of saying non-sequiturs and mumbling sarcastic comments under my breath. The atmosphere seems pretty typical for this type of function. Light jitters. Appropriately subdued and managed levels of libidinal energy. But like the first day of school, everyone is definitely on their best behavior. I’m looking forward to learning more about everyone’s personality in the upcoming weeks. Ron makes some jokes that exhibit a decent sense of humor possibly sympatico to mine. He also drew a neat looking cartoon spider for his ice breaker. Lauren Jensen comes in around 9:40. A Writing Project alum/mainstay, Lauren will be running us through the first demo lesson of the Institute. She gets us writing with a question about teaching non-fiction writing. There’s nothing I can say about her that hasn’t already been said by way more accomplished people. She’s hyper-literate, driven, organized, and frighteningly knowledgeable. Lauren comes prepared with a vast array of instructional materials for us. Her lesson is an enjoyable combination of air-tight sequencing with off-the-cuff moments of improvisational commentary. I’m not going to type out much more about it, but if you’re interested I recommend checking out my blog. The time is now a little past noon, and we’re starting to get peckish. We eat lunch. Nothing too noteworthy to say about it. Michelle Hasseltine begins our first afternoon session by preaching on the power of social media. I cannot cosign enough. Tweet at authors. Connect with teachers. Engage in conversations. Almost everything good that’s happened to me professionally has come in some way from my interactions with others on social media. Michelle is a force of nature. Great teachers have presence, the seemingly preternatural ability to attract attention in a room. Michelle has this in spades. All eyes are glued to her as she walks us through the blogging process for the Summer Institute. She makes a passionate appeal for everyone in the room to wiggle at least a big toe toe in the waters of social media. Next O.F.L. provides us with a guided tour through the syllabus with special emphasis on the summative portfolio. Everyone will be writing blog posts, completing statements of inquiry, writing various reflections, and etc. We’ll be in writing groups, reading canonical texts, and more. That’s it. No linguistic or textual pyrotechnics, no formal experimentation, just a straight-forward, chronological narration of the first day. You heard Lauren Jensen tell the room that the Writing Project was the most powerful professional development experience of her life. I’ve heard the same sentiment echoed by nearly everyone who has experienced the ISI. Personal growth often occurs in fits and starts. It’s my hope that what happens during the next four weeks will reverberate through you for years to come. After morning pages Lauren Jensen comes in around 9:40. A Writing Project alum/mainstay, Lauren will be running us through the first demo lesson of the institute. This 3-week lesson cycle involves using profiles in the writing classroom (She gave a version of this during last year’s ISI, as well). She gets us writing with a question about teaching non-fiction writing. Lauren begins by asking us to write down our initial response to the question: What do you think of teaching non-fiction writing to your students? My answers will always be in red. I love it! Non-fiction writing is perhaps my favorite topic/genre to teach. I’m immensely interested in personal stories, self-expression, and any kind of writing that draws its main inspiration from the stuff of lived experience. Similar statements could be made about all writing, for sure. But personal essay writing is just so wonderful to read, write, and teach. When it comes to more traditional school-based non-fiction writing like research papers, I’m neither excited nor underwhelmed. I haven’t done a lot of research writing in the past simply because I haven’t spent a lot of time looking into how to do it well. I’ll probably look to remedy this omission in the upcoming school year. I’ve read a few nice essays examining the benefits/pitfalls of classroom research writing and I feel more comfortable wading into those waters. We share our answers out. Some of us approach non-fiction writing with trepidation while others say they enjoy the structures of fact-based compositions. It’s clear that teachers and students alike hold strong opinions about this. The beginning of successfully teaching non-fiction is unpacking what we mean by the genre. She takes us through quotes from past students who all speak to the point that teachers have pretty much ruined non-fiction for most kids. They find it boring, pointless, and requiring way more editing and revision than it’s worth. 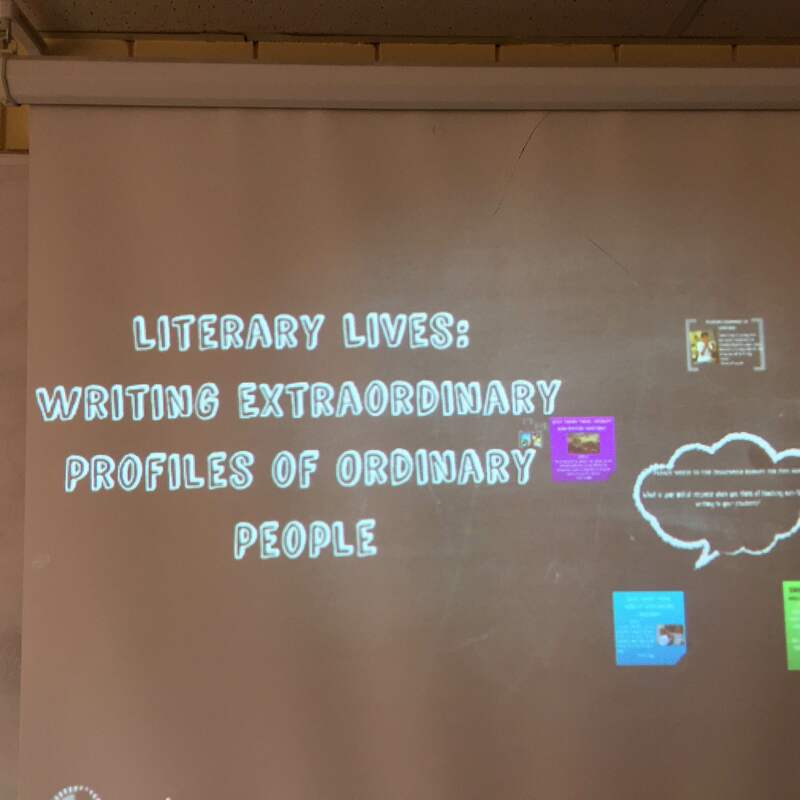 She next points out the disconnect between what many of us have our students read (literature) with what we then ask them to write (5 paragraph essays). So she wants to introduce more “real world” writing, composition that’s rooted in authentic audience, genre, and process. That’s where non-fiction profiles come into play. She begins by tying her portfolio unit into whatever her students are studying at the time. Portfolios are malleable. They can fit into most units because interesting people come from all walks of life and are found in most texts. Portfolios are also found in a wide array of periodicals such as Rolling Stone, In Style, and the New Yorker. As a result, this unit, although quite complex in nature, allows for differentiation, incorporates pop culture, and pushes students into some pretty complex levels of thought. She introduces us to the genre with a spirited reading of Susan Orlean’s Show Dog. It’s awesome. We then discuss what we noticed about the genre. It’s creative, it uses facts, it’s funny, there’s an element of narrative, it’s non-fiction, it requires research, etc. It’s a wonderful blend of methods and styles. Above all else there’s a sense of intimacy. Intimacy between both the author and subject and the author and reader. Here’s her process. 1. Profile genre study: What do you notice? Immerse yourself in the genre. Read a lot of them. Talk about them, etc. This is a basic component to most inquiry models. 2. Find interview subject and write a letter of invitation: family, friends, family friends, friends of family. They have to learn how to go out into the community and ask people. Plenty of opportunities here to make bridges with the community. 3. Write contextualization essay: 3-4 paragraphs. Requires each student to do some research and acquire important background knowledge about the interviewee and their topic. 4. Practice with recording equipment: pretty self-explanatory. Never assume that students are familiar with technology. Always teach. 5. Conduct mock interviews / craft interview questions: Practice interviewing people who give 1-2 word answers. Go through a few common archetypes. Problem solve in the moment and try to foresee problems. 6. Transcribe interview and select quality quotes: they transcribe the best part(s). It shouldn’t go beyond two pages. 9. Write thank you notes to interviewees: actual notes on actual stationary – the thank you note is a valuable genre! You see how the process is multi-layered. It leans on the community. It builds and values empathy. It requires research, reading, and writing. We partner up and go through a genre study using some mentor texts Lauren provides us. The portfolios lend themselves to skillful inferences on the part of the reader. They’re rich in description (about the subject, the setting, the events, etc). Parenthetical asides. These portfolios are masterclasses in studying tone, mood, and writer’s voice. How to select important information from a sea of writing. They’re a great way to start talking about writer’s craft. The last step of the process is to write out our questions and then interview each other. At the ISI we introduce each other using the information gained from these portfolios. Like a drop of soap in greasy water we immediately scatter to the corners of the floor to find some peace and quiet in order to interview each other. After that we spend the final pre-lunch minutes debriefing about the lesson cycle. While having someone as powerful and polished as Lauren present first can increase the intimidation among participants, kicking off the Summer Institute with such an effective demonstration lesson sets the tone for the rest of our time together. A few of us share out what we’ve written on our profiles before the ink is even dry. A few of us sandbag our reading with “This isn’t that good…,” a common mea-culpa among growing writers. A few of us who have done this before know how to handle it; we shout out “shut up and read the crap!” We’ll no doubt repeat this mantra multiple times throughout the Summer Institute. By the final week anyone silly enough to begin with such a self-deprecating aside will find themselves on the receiving end of a rowdy vocal chorus. Shut up and read the crap. Now we have Nick Maneno. He’s one of the many rockstars of the Writing Project. He is a model for pretty much all of us. He apparently begins most of his emails with, “hmmm..” I think I’m going to start doing that. Student Made Standards Based Rubrics: An Inquiry Approach to using a Mentor Text to identify standards, develop a Rubric, craft and score a poem. Nick begins by talking about how he isn’t really that into rubrics. But he works in a school system that uses Standards-Based Grading (want to learn more about it? Look up Rick Wormeli. He’s sort of like the guru). 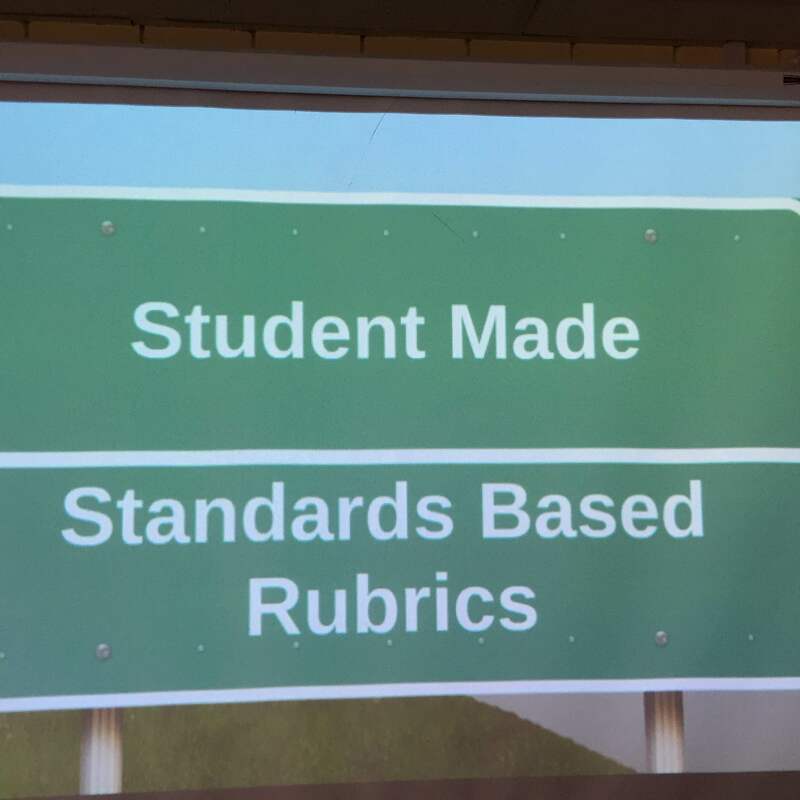 Nick says he likes neither rubrics nor standards, but he has to make it work. So this demo lesson is an attempt to make all of this work. Please note that this demo lesson write-up will be devoid of any authorial commentary by yours truly. Quickwrite1: List some things you do for fun and recreation. Sorry about the poor quality! Then he tells us to read it again, only this time looking for literary elements and text features. What standards do we see being used here? We discuss movement, font size changes, capitalization, onomatopoeia, author’s purpose, exaggerated spellings, non-standard use of line breaks and white space, (link here to Katie’s presentation), alliteration, strong verbs/word choice (link here to Janique’s lesson), a title (link here to Michele’s lesson), parallelism with the ‘ing’ forms, we gerunds. We get ourselves together in groups of three. Three is the perfect number, he says. You get a diversity of opinions while still allowing a space for everyone to give their opinion. We add polysemous words, some repetition, the form paralleling the content of the poem, and more. (Nick says here that collaborating and turning and talking with partners is the most important part of his classroom. Nick gives a plug for “Teaching with Your Mouth Shut [which I’ve never heard of! Amazon, here we come]). I’ve already learned so much from just this conversation. 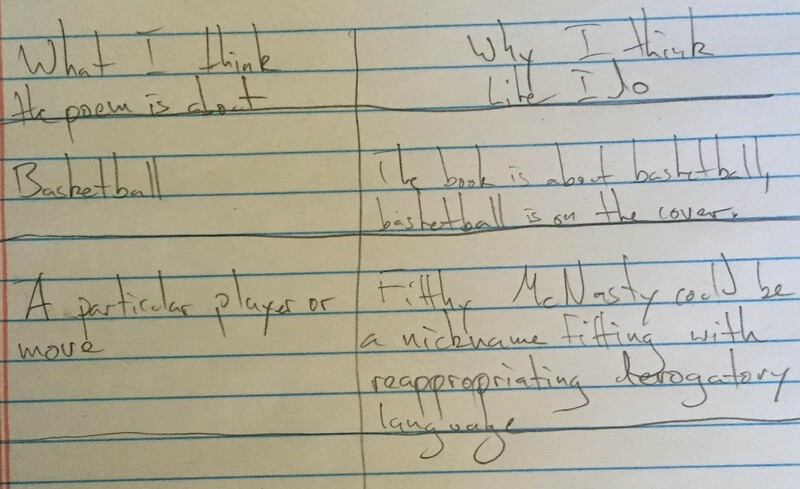 Nick is going to have us write our own poem using the Kwame Alexander as a mentor text. 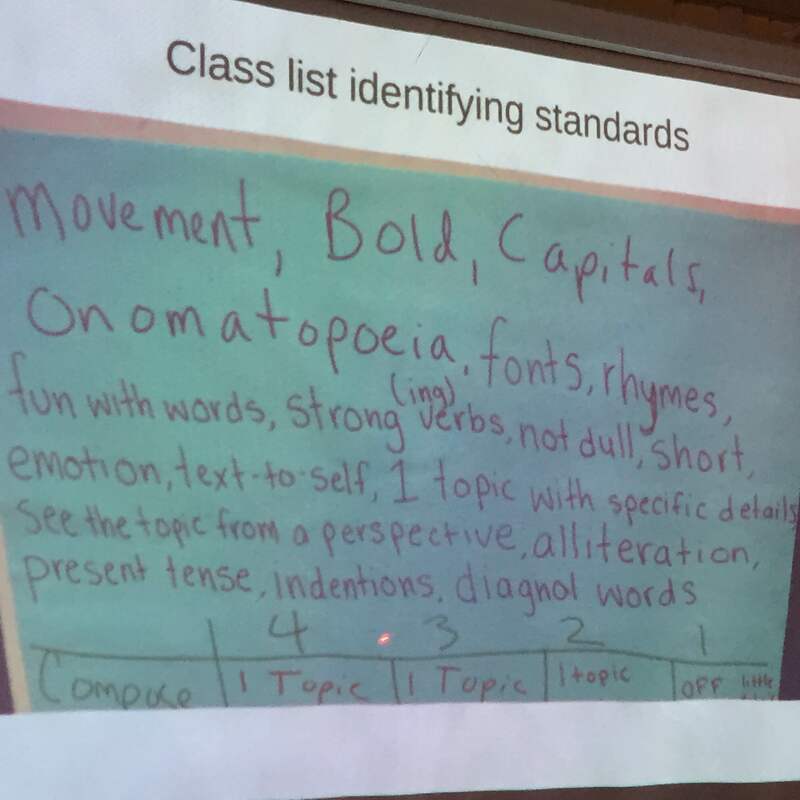 The first step is to compose a rubric for the poem we’re about to write, using the Virginia writing standards of ‘Composition,’ ‘Expression,’ and ‘Mechanics.’ I don’t get very far. We work on our rubric individually, then we go back to our group of three and try to put it together. Nick tells us that he doesn’t really care that much about the rubric. The important part, he says, is the dialogue parsing out what it is that makes a poem successful or not. Nick ties this into the Inquiry model. 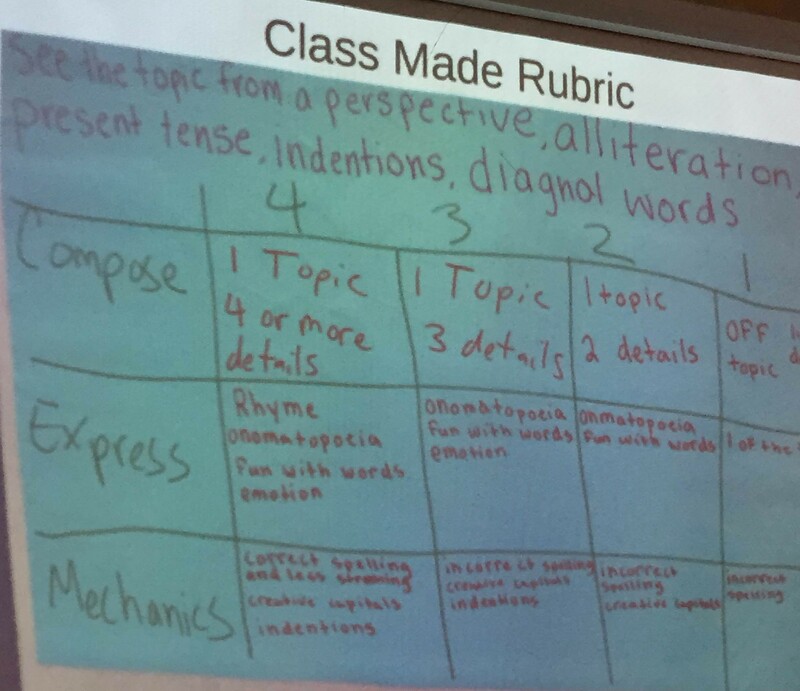 Immerse students in the genre, and then have them create a rubric for what they’re about to create. Here’s the rubric Nick’s class came up with. Nick wants us to now write a poem emulating Kwame Alexander’s poetic form following the class’ rubric. I’ve written mine about one of my hobbies: watching Northern Lion’s YouTube Let’s Play videos after work. I do this religiously every day. I’ve been watching his videos for months, and by now I feel like part of the family. Interesting connections here with online communities, video games as an industry, YouTube as a public sphere, etc. Here’s my draft! Now he has us ask ourselves the following questions: What did I learn by doing the rubric? Did it help me learn? To be honest, our group was more interested in gabbing about our poems than we were discussing the rubric portion. 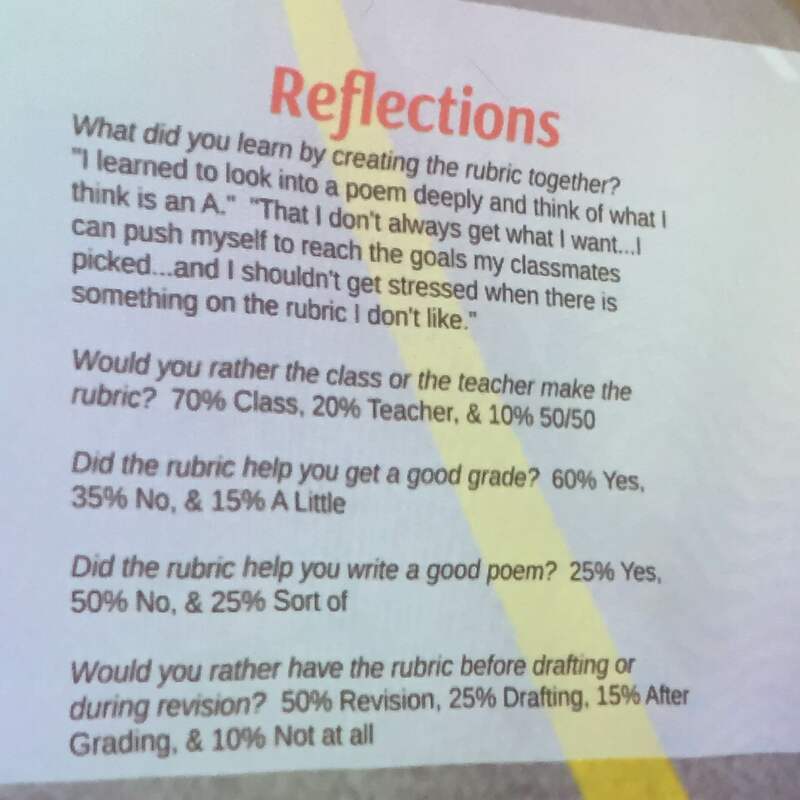 Nick then shows us a powerful slide reflecting what his students thought about the rubric process. Next up is Essaying. Nick sets us up with a T-Chart. He calls this the Chronologic method, which I love. Chronologic writing comes from Paul Heilker. Left side is “What I think the poem is about” and the right side is “Why I think Like I do.” He then reads us a poem line by line. 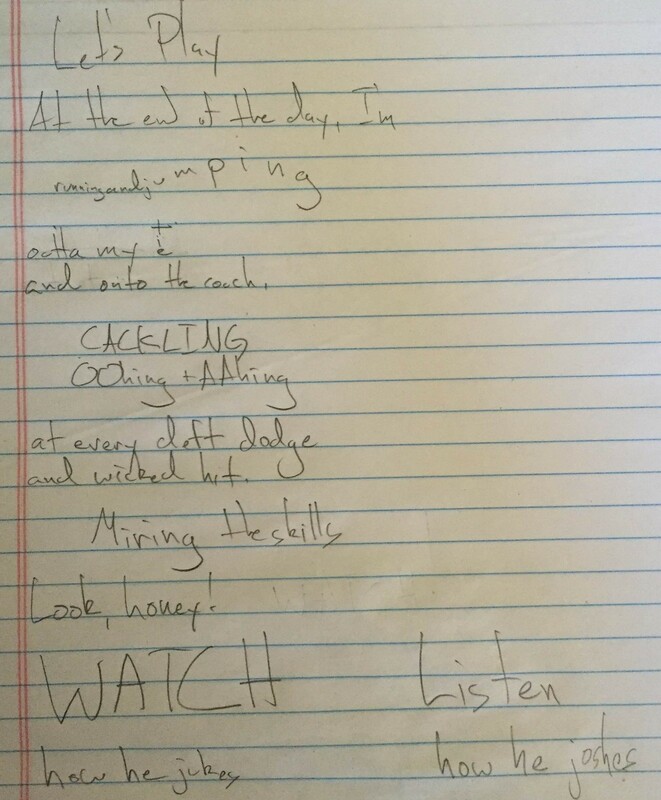 After each line he stops reading and we keep a running log of what we think it’s about and why I think the way I do. The evidence falls into five categories: logic, life experiences, intuition, emotion, and text evidence. These are the five paradigms of essay writing, he says. This type of line-by-line analysis is an excellent way to promote the essay as a tool for understanding. Nick is interested in reclaiming the essay for ‘writing to learn’ instead of ‘a record of learning.’ He mentions that the French verb ‘es say’ is ‘to try.’ So he encourages us to use tentative language (instead of the authoritarian language often taught alongside the essay). Coming to understanding through stages of measured analysis and thought. After each stage the class discusses our various interpretations and reasonings. We’re encouraged to ponder each new perspective, adding it to our own if we want. The essay becomes the combination of the Chronologic thinking. Claim and evidence moving forward towards a new point of understanding. Today begins with a presentation by Lauren Jensen. She gets us writing with a quickwrite: What’s your initial response when you think of teaching non-fiction writing to your students? Well, for me the answer depends on the sub-genre within non-fiction. For instance, I love teaching anything dealing with the affective realm. Memoirs, personal narratives, biographies, little slices of life, etc. The type of non-fiction that centers around an emotional core. I’ve stayed as far away from research papers as I could possible get. Not for any real reason. I think I was more interested in pursuing a strictly “creative” writing path last year for myself and my students. My final thought chunklet has to do with genre. Creating specific genre divisions seems a bit too arbitrary for my liking. But, I think this is again a reaction to what I perceive as how non-fiction is usually handled in schools. This is odd because I used to quite like “dry” academic style writing. This is an area I need to explore. Jensen places this lesson within the context of non-fiction. She’s from NY, where PARCC, the Gates Foundation, the Wal-Mart family, and Common Core have created curricular approach centered around non-fiction. How could she motivate young writers in her classroom given the circumstances? She tells us to ignore mandates we don’t agree with and take control of our classrooms. Cosign! She teaches “real-world” non-fiction writing. Composition rooted in the events and purposes and complexities of a student’s lived experience. That, as Grant Wiggins would say, ‘audience’ and ‘purpose’ are not mere buzzwords; they are task-defining. Jensen uses a focused quickwrite to help us understand how the profile project fits into her curriculum. Quickwrite2: Pick a topic and write on it! Does war affect both those directly involved and those on the periphery? If so, what are the effects? How does war fundamentally change those affected by it? I’m going to answer this one from my own experiences. This is a tough issue to write about. Just thinking about war in the abstract brings up so many issues: patriotism, sacrifice, power, class, propaganda, money. (Also, I remember buying the Desert Storm trading cards that came out during the 90s.) Take the war(s) in Afghanistan. I struggle to find specific ways I’m affected. This probably reveals an embarrassing blind-spot when it comes to my knowledge of the human cost of war and the way massive conflicts shape public policy. I don’t know anyone who has fought in a war. I don’t come from a military family. My understanding of the human cost of war comes through primarily secondary sources. Wounded Warrior commercials. Works of fiction. Now, I’m not devaluing the role of fiction in portraying the reality of war. I’m just explaining that my perception of it is filtered through complex layers of politicized media and consumer goods. Everything I’ve written ignores the question. We share out. Some of us talk about how this question leads to a wide variety of answers. Everyone has different experiences. ESOL kids, people living in the NOVA area. So many factors affect the answer. Jensen uses this project to find and give voice to people who have participated in war. This is her framing device. She uses profiles to get answers to the two quickwrite questions. Her 10th graders went out to retirement homes and the community to find people to answer these questions. She begins by introducing the genre to students. Immersing them in examples of the genre from the “real world.” Where are profiles found: The New Yorker. InStyle. Rolling Stone. Sports Illustrated. She reads us part of a profile to have us try and figure out what a profile is. We listen. The piece is called, ‘Showdog’ by Susan Orlean. We talk about the elevation of the quotidian. Insider vs. outsider perspectives. Physical descriptions. –write contextualization essay: a little research on the military conflict in which the individual was involved. or about being a spouse/military family, etc. This helps them write questions and approach the subject correctly. –practice with recording equipment: record using digital recorders, have them use their phones, etc.This allows the student to write down other obsservations about body language, description, mannerisms, etc.Video recording works as well. Activity 1: We partner up and grab copies of mentor text profiles Laura kindly brought for us.We read and fill in. The sheet we fill in has us list any characteristics we notice and then write out evidence from the text for it. We come up with genre conventions like quotes, family background, physical description, quirks, others’ comments and observations on the interviewee, reason for the interview, text features, and the gradual occlusion of the interviewer’s voice by the interviewee. Activity 2: Select an angle (showcasing how extraordinary the person is) for the interview. Open with biographical questions (trying to focus on open questions vs. closed questions). Record details about the setting, physical description, mannerisms, and other minute details. So many “soft skills” at work here. Empathy, discourse, personal skills, reading body language. Connections here with the oral standards, with helping ESOL/ELL kids, active listening. All of this has to be taught and practiced before the actual interview. Activity 3: Interview! OK. So I’m going to interview my neighbor. We both decide to use the angle of “how you became interested in progressive values.” Sweet! Now I’m going to come up with my five questions. Her responses are after the questions. 1.Tell me about yourself. I’m _______. I grew up in Boston and have lived in the DMV area for five years. I’ve pretty much known forever that I wanted to be a teacher. My mom was an activist involved in the community. So I grew up in a social justice type environment. Her mom helped steer her into teaching as a job. She volunteered in a public school her senior year of high school. A fight broke out in the classroom she was observing, leading her to examine her own privilege. 2. What is the most difficult part of your job? I’ve definitely worked with some challenging kids, but the hardest part is dealing with the adults, who don’t see issues in the same way that I see them. I consider myself to be very educated, and I get pissed off when I see teachers following trends without thinking critically. So negotiating those interactions and trying not to cuss someone out. At my old school, for instance, at my old school we had a major test prep initiative. I was one of the only teachers to raise questions about why we were doing it and what the purpose of it was. It was a situation of educators doing things even though they’re not the best choices for kids. It’s very hard to explain these things without coming across like a jerk. 3. What do you like about teaching? I love interacting with quirky kids. I love being around children and their different personalities. Sharing with them the power of reading. Not analyzing a text to death, but what does this particular book help you understand life. This view of reading is in conflict with the road I think we’re heading down, which is a process of reading a text to death. I was just reading about an EngageNY program about close reading a text for seventeen days. I’m leaving a private school to go back to public schools because I felt disconnected from the larger debates about education. 4. Do you hold values in conflict with society? 6. What is your take on the state of American education? I think that American education is under attack by people claiming that they really care about poor children. However all of the policies show that they don’t actually care about them, and that in fact they want to keep the underprivileged in their place. When I hear Diane Ravitch talk about how public schools haven’t changed that much, I realize that I need to work to understand that. I know that schools can’t do it all. Corporate ed reform has this belief that schools can do it all. We need to start addressing poverty and supporting community growth. Not just attacking schools and teachers. Wow, that was so fun! We both just opened up. Talking and riffing off of one another. We share out about how amazing this was. How much we learned. How even the most “basic” question has the power to illicit a wealth of discourse. 2. Craft lessons (based on student requests): selecting quotes, describing the setting, giving them options. Then, they go and write three freewrites on particular genre characteristics discussed earlier. Like, a freewrite only focusing on physical description. 5. Compile portfolio: Use students! Create committees! Put them to work! 6. 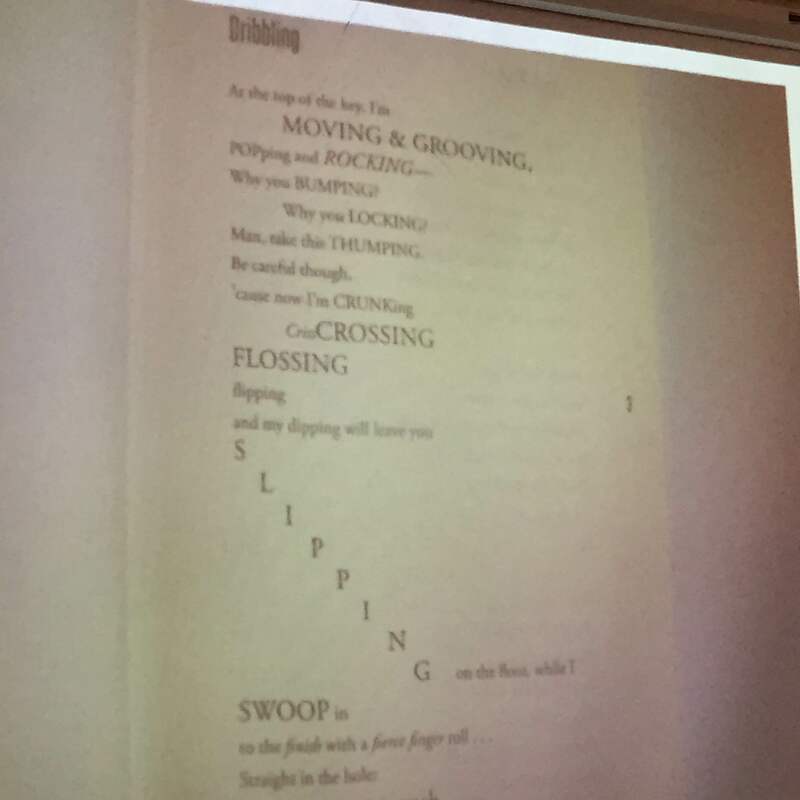 Class publication / public reading with distinguished guest:She requires students to select their best, most emotionally charged 2-3 paragraphs to read out. 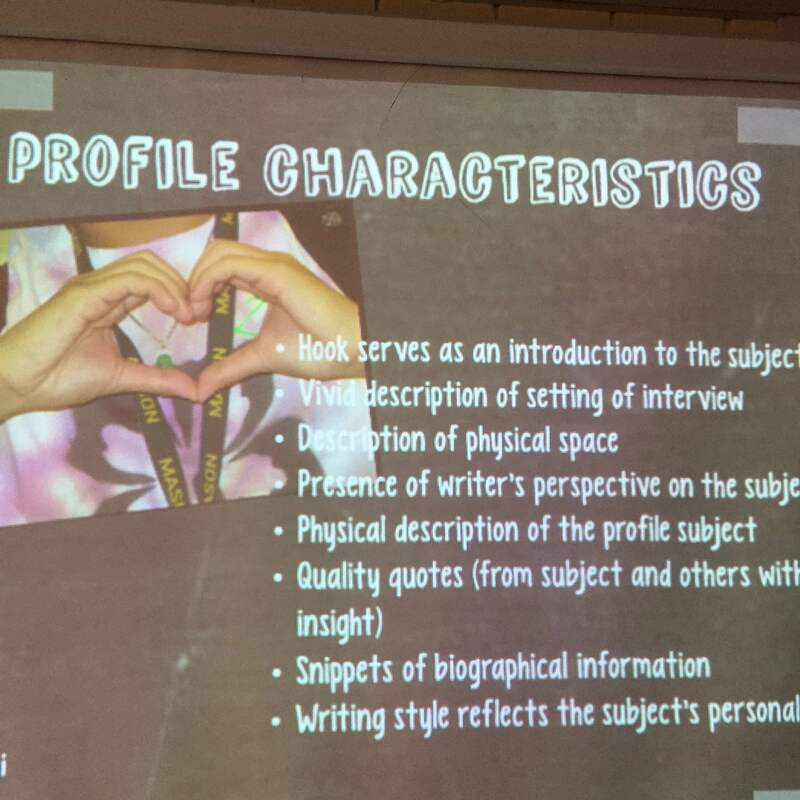 Activity #4: Take some of your interview and what you know about the profile genre and just start writing. See what happens. “We can sit on the floor, if you want. I don’t mind getting dirty,” Janique tells me as we search for a place to conduct our mutual interviews. You can tell a lot about someone by what they say when the stakes are low. This off-hand comment hints at an identity uninterested in the trappings of formality. A sense of self favoring action over poise. Janique Parrott comes from a family of agitators. Social justice as a birthright, a mantle. That took me a while! I’m a slow writer, especially when I want to do a subject justice. We go around the room and share out. Smiles overwhelm almost every face. So great! Phew! What a lesson! Time for lunch.